Perhaps there's an image for many folks that the beach is just for laying on on holiday, reading a book and turning into a lobster, and that you need to travel to another country to do that? I'm not a sunbather. I get bored sitting down for long periods. What I love to do at the coast is to explore. Years ago I even had a job where I got to spend most of my days poking around in rockpools and searching for fossils in the mud. 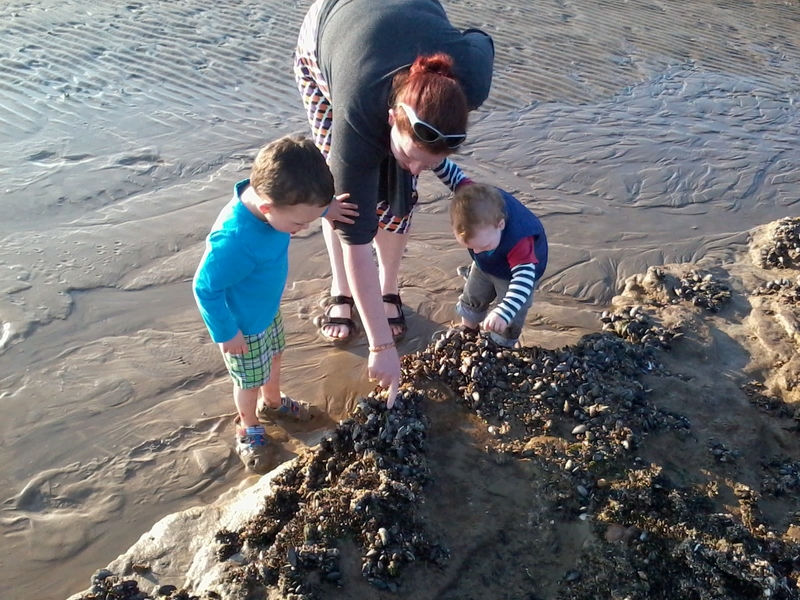 In total the number of kids I've taken on beach walks, rockpooling and fossil hunting number into the hundreds. Now I get to do it all over again with my own children. The Hastings area doesn't have exposed sand all day (if you want that, the nearest place is the dunes at Camber, less than an hour's drive down the coast from here). What we have is a lovely pebbly beach, with steep berms that shift depending on the presence or absence of stormy seas. When the sea goes out we have miles of sand, perfect for little legs to run around on, playing games and building sand castles. Even better, we get rockpools. I'm not going to lie, they're not the best rockpools I've ever explored, but a lot of fun can be had with them nonetheless. Children are always fascinated by the variety of creatures they can see in a short time, many of which are slow and hardy enough for even the littlest toddlers to get a good look at. A net and bucket is helpful, and if you are being really organised a rockpool viewer (a plastic tub with a transparent bottom - I just use a transparent plastic Yeo Valley yoghurt pot with the cardboard label peeled off) will allow you to see past the reflections at the surface and see glass shrimp and sometimes fish swimming around. Lifting fronds of seaweed often reveals crabs, as does turning over stones. It's all a good way of getting kids enthusiasm fired for observing the natural world, and a good opportunity also to instill in them the mantra of 'handle gently and return your finds to the exact spot you found them'. If your little one manages to pry off a limpet, for example, it's really important to replace it where it came from as they make their own home groove in the rock which they will return to each time the tide goes out. There are loads of great guides available online with everything from the best beaches to visit, to identifying your rockpool treasures when you get there. 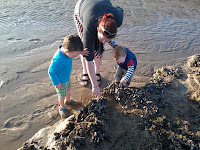 As an outdoor classroom the sea shore is definitely one of the best places you can visit. For a really embedded learning experience, you could introduce some of the things you may look for in a book before you visit (or for older ones, find out together about tides, the intertidal zone etc...), then visit and take photos, and afterwards get little ones to draw pictures of what they found, look at photos of the trip together (older children could add these into a project book covering things like how the animals and plants are adapted to live in this zone) and maybe use themed songs and rhymes to remind them of their visit ('she sells sea shells by the sea shore' for example is thought to be about Mary Anning, the famous Lyme Bay fossil collector). Haha! Best school trip ever despite the periwinkles!